Stampin' Up! UK Demonstrator - Teri Pocock: Vintage Vogue and Open House!!!!! I will be having a FREE Open House day on Saturday 10th April to celebrate the release of the Mini. You can pick up your FREE copy from me on the day and also see and have a play with all the fantastic new products that will be available. Anyone placing an order with me during my Open House Day will receive FREE postage & packing. There will also be a free raffle for anyone coming too! Teri what a gorgeous gift set!!! 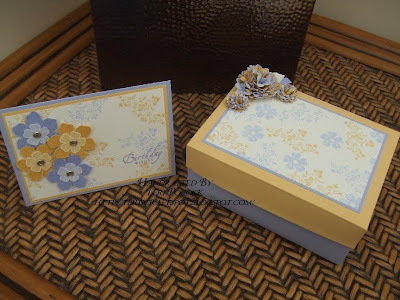 LOVE your box and the matching card...Beautiful project! best of luck to you with your open house. And I agree Vintage vogue is a fantastic set of stamps. And you've totally proved that with your matching card and box.The flowers on the box are stunning! Wish I could come to your open house!! beautiful work as always Teri! Wow, this set is gorgeous, love the colours you have used too... thank you so much for my lovely gift you gave me last Saturday, it was really much appreciated and I have done a post on my blog about it too.... it was lovely to meet you at last too... thanks once again.